Whether your Golf Cart is used for getting around the course or for driving to the neighborhood pool, keep it looking its best with a quality Golf Cart Cover by Carver. 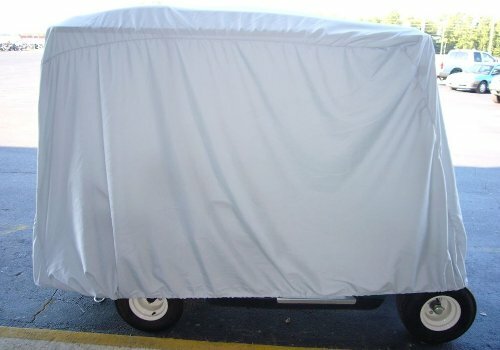 Carver makes it easy to shield your golf cart from the elements with an easy to install cover. Choose from 2 passenger and 4 passenger golf cart covers in Carver's Performance Polyguard fabric. Carver's Performance Polyguard is a 100% true loom woven marine grade polyester. This material is soft and very easy to handle, weighing about 8 oz per square yard. It offers an extremely high tensile strength meaning it is very tear resistant. This material is many times better than the standard non woven materials which are most common today in the cover industry. Carver covers come with a money back satisfaction guarantee. What can you expect from RVCoversDirect.com? Easy installation-simply pull the cover onto your golf cart and go! Your 2 seater cover will be constructed with shock cord in the hem for a snug fit. Each Golf Cart Cover Package comes with a FREE mesh storage bag. All Golf Cart Covers are in stock and ready to ship directly to your door.